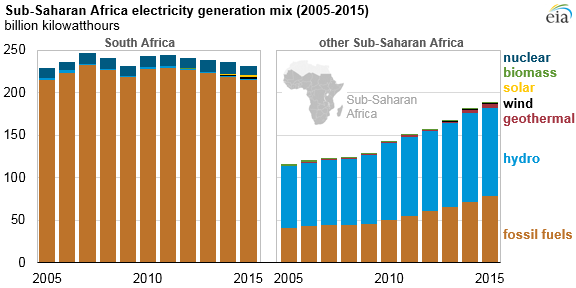 According to EIA’s international electricity statistics, hydroelectric and fossil fuel-powered generation were the top sources of growth between 2005 and 2015 in Sub-Saharan Africa (SSA), defined as the 49 countries fully or partially south of the Sahara Desert. During that period, hydroelectric generation increased by about 40% in the region, while fossil fuel-powered generation increased by 15%. SSA electricity generation totaled about 420 billion kilowatthours (kWh) in 2015, including distribution losses and exported electricity, an increase of 22% during the decade.